Hello Gregory Juarez! Thanks for taking some time to answer some questions for our readers. I'm so glad to share some of my thoughts with you, I guess our audience will find our conversation intriguing and maybe we'll inspire them to get into the business. Q: How long have you been tattooing? What inspired you to start tattooing? A: It’s been 2 years and 7 months since I started in this beautiful field of art which has been a great experience of development and learning. Since I was a child I was always passionate about drawing and painting because my father loves to paint, I had the opportunity to see it at times and feel attracted to everything it entailed. It was a hobby of mine to draw and paint all the time. I never took it as a profession or very seriously, it was more an escape from reality towards something I liked to do. As a teenager I was in the field of graffiti for a while from which I could learn a lot based on styles and creative development along with a cousin Jesus Alvarado and a friend Rohil Guerrero who then began started tattooing, they always told me, “you should start tattooing I know you’d do it very well!” Over time I made the decision to start this and it was something very special for me. Q: Did you find difficult getting into the business? What was the main goal you've had back when you were starting? A: It was a bit difficult because at that time the situation in Venezuela was complicated. 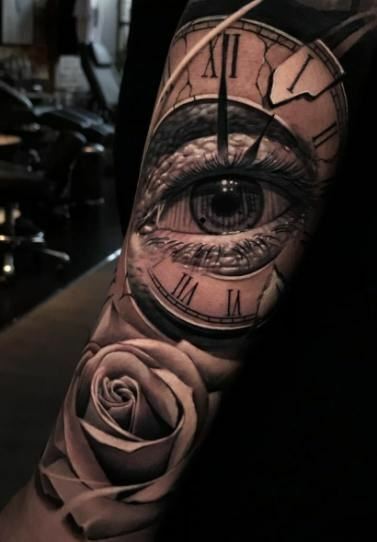 My main goal was to be independent and dedicate all my time to tattooing, after about 3 month or so I was able to open a small studio, together with my friend Rohil. 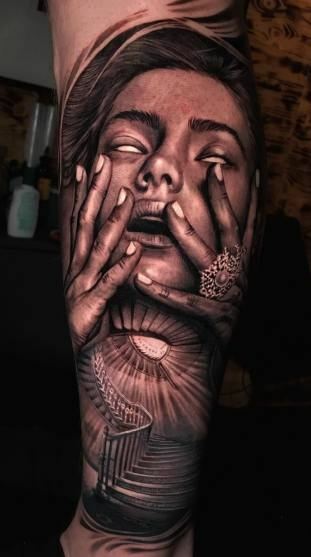 I started buying only a machine and a friend lend me the rest of the equipment to start, it was then I made my first tattoo on my own leg, I did so because I wanted to know what it felt like to inject and feel what I was doing. After that, several friends offered to be “guinea pigs” and I did small things on them to learn a little more. - Did you have any mentor? My mentor was my cousin Jesus Alvarado, he was the one who taught me how to see the process beyond just a mark on the body, to inject, fill and shade. I practiced with him many times making a sleeve with only lettering (which I have not finished yet) because when I was into graffiti, I was good at making letters. I scolded myself when I did something I shouldn't and at the same time encouraged me to do better since I work with skins and it is not something that you can erase. I will always be grateful for all the knowledge he shared that led me to do what I do now. Q: What's the best approach in order to get better knowledge of this type of art? A: Discipline, perseverance and dedication are the fundamental bases to grow as a person and as an artist, patience is very important to get a good performance. It is a long journey we are taking on, we will never stop learning, so we must always be attentive to what we do in order to learn from ourselves. Q: Your portfolio looks very professional. Every tattoo is done perfectly, makes me wanna love more black & gray tattoos now! 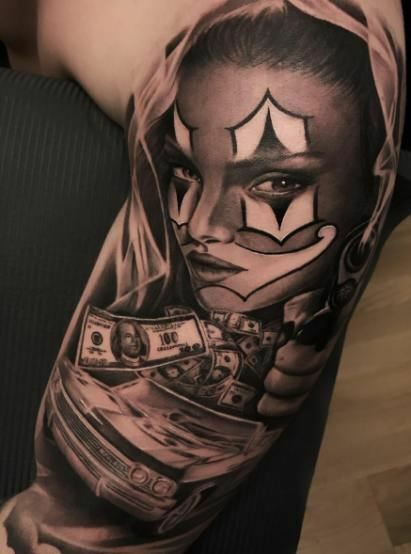 Haha I don't believe I've seen any color tattoos, do you prefer this type of work or you plan to surprise us in the feature doing some color tattoos? A: Thank you very much for appreciating my work, it is very pleasant to know that I inspire other people to get more tattoos. I really like black & gray due to the level of realism that can be achieved. I seek to perfect my technique every day to obtain the best result, always learning. I plan to start with color after I master what I’m doing, to start studying something different. 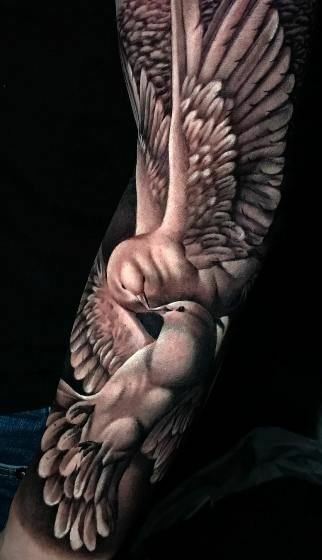 Q: Since there is no "undo" or "edit" option when it comes to tattooing, what parts of doing realistic piece you find as most difficult and time consuming? A: Everything depends on the design and what’s going to be done. I would say that each tattoo is a challenge and something that I have to face in the best way possible, the difficulties and time don’t mean anything, everything depends on the performance of oneself. 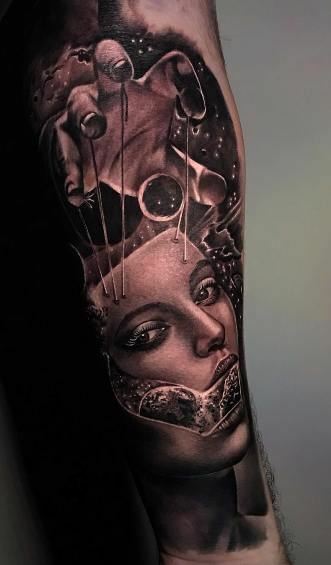 Q: I really love how you combine more than one photo in one final tattoo design, very creative. How do you cope the first few ideas to the final, do you draw a bunch of sketches or do you allow your clients to bring some reference images? Tell me a little about the making process. A: Thank you very much for appreciating it. I take into account the references that the client gives me, but for each design I interpret it my own way. Normally I don’t make more than 2 or 3 designs. I seek to create something different and sometimes that can take time, as in other occasions I select a single image and the rest flows while I tattoo, it’s something more authentic since the interpretation of each artist is very important. Q: Many beautiful portraits, do you have any "dream" piece or just a favorite person you wanna put on someone's skin? A: Lately I’ve been fascinated by portraits, it’s a great challenge when you have to portray a family member and when you finish it, you feel a great satisfaction for the person to whom you fulfilled their dream. 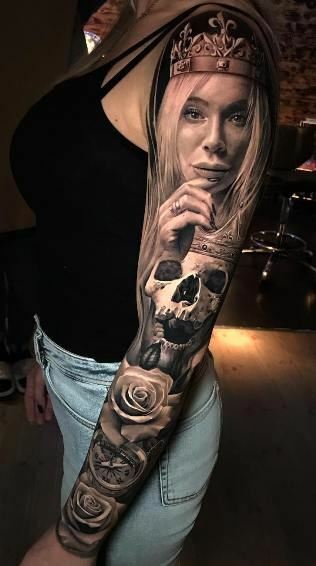 I’ve always wanted to tattoo celebrities whether they are singers, actors or musicians, I think they have a lot of impressive references with which you can create something very special. Q: We all know that doing the final touch ups and the white ink at the end is the most painful part of the whole session, I've been there! How do you cheer up your clients in those moments? How much is important to have a nice, friendly attitude while still remaining professional? A: It is very important to treat the client good, so they can trust you and your ability to work calmly with the best mindset. When it comes to tattooing the energy is very important as we should feel the best, to perform our best. White’s always a bit painful but it is a very important part of the process. Sometimes I ask them if they swam so much to die on the shore? There are many things at stake and to give my client a good job is to see them happy, but that depends on both. 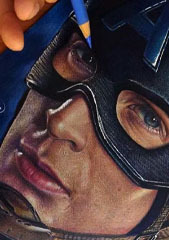 Q: Some artists give their clients some time for the skin to heal and then finish the process in a few weeks. This is most common when it comes to big tattoos, such as sleeves and back pieces. Do you remember the longest session but still having to book more sessions? A: If it is normal to work in this way. I usually make large pieces in two continuous days of approximately 7 hours each session, the result is very good and quite fast. 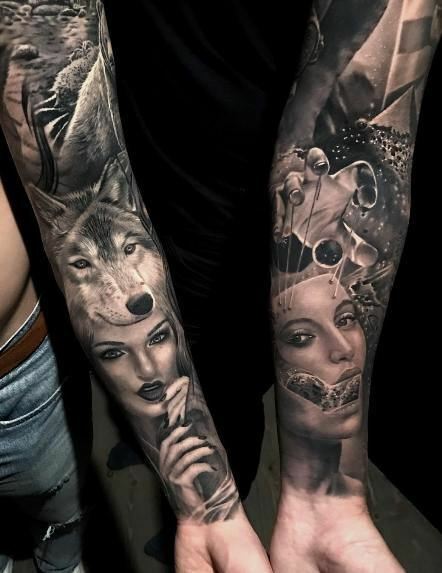 When making sleeves works that way, of course it also depends on the client's conditions but the normal thing is to go for sessions between periods of 7 to 10 days. I would say that the longest session I’ve done is about 12 hours. - How we can book an appointment? What's the procedure? Contact the studio via Instagram DM (@vasterortsblack on Instagram) and they’ll help you with everything. Q: What's the most rewarding aspect of being a professional tattoo artist? A: Without a doubt, the pride of my parents that’s my motivation. It is also nice to know that I can be a reference and inspiration for other artists who are starting in this field, this is what I love the most and what I dedicate all my time! Thank you very much for giving me this opportunity! It is gratifying to know that my work is reaching new people in the world.